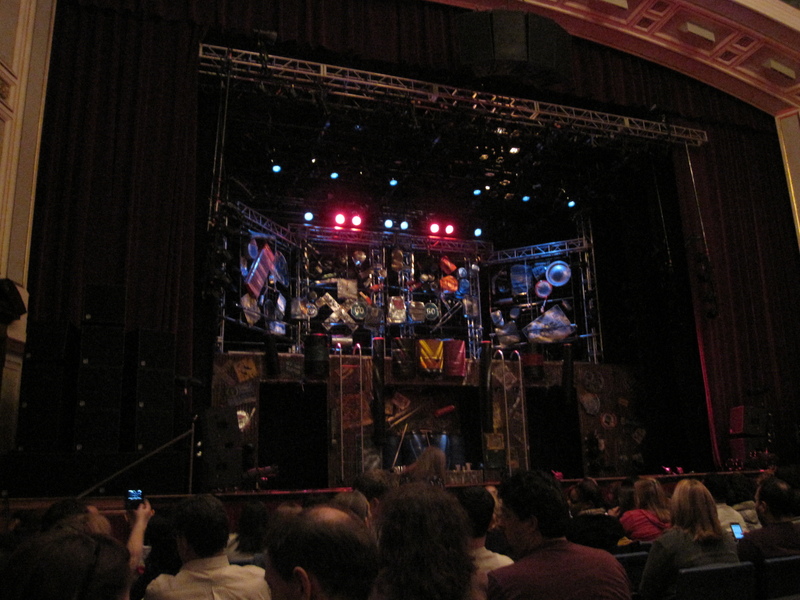 Last night Price and I saw STOMP at the Lowell Memorial Auditorium. It was my 5th time seeing this show. Clearly I love it. I started seeing it when I was younger and saw it 4 times within a few years. My Dad saw that STOMP was going to be touring in MA so he got us tickets for our Christmas gift. I have no rhythm. I can’t keep a beat. Clapping is lost on me. I think that makes me love the show even more. (Plus it feeds into my love on drummers) I am utterly amazed by the show and how they create this stunning music with everyday items. Just 1-7 people performing at a time. It can start with 1 person tapping, then one by one the others come on stage with their “instrument” at a different beat. At times it sounds chaotic and then suddenly it all makes sense and they all hit the same beat with a bang. The one thing that I completely forgot about was how much audience participation there is. It’s just clapping and stomping but the interaction with the performers is so much fun. Again it reminded me how I have no memory and rhythm. Luckily Price can keep a beat so he did enough clapping and stomping for the both of us. Still so fantastic!